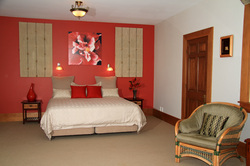 Accommodation is provided in two suites in the guest cottage. Facilities in the cottage include tea/coffee making facilities, microwave, refrigerator, TV/DVD, stereo, broadband wireless internet connection. 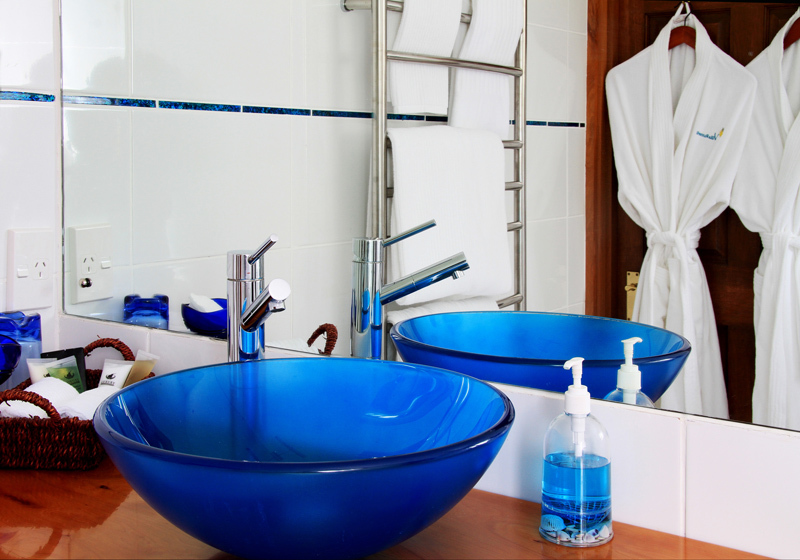 In the ensuite bathrooms, hair dryers, robes, shampoo, conditioner, shower gel and body lotion are provided. 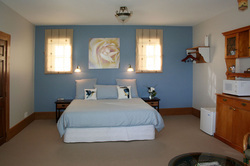 This suite is decorated in soft blues, with influences from the colours of our native Kingfisher, for total relaxation. From the minute you wake in your super king-size bed looking out over the bay until you sit on the verandah, wine glass in hand watching our magnificent sunsets, you will feel you have arrived in Paradise. The room is spacious with a large ensuite. There is also a small kitchenette with microwave, fridge and tea and coffee making facilities if you want to just chill out. Russell​ and most of Northland is noted for the exuberance of the exotic Hibiscus so we felt it appropriate to decorate this suite in hibiscus colours resulting in a warm welcoming room. While you rest in your suite with super king-size/or twin beds, or on the verandah, the native tuis and wood pigeons will keep you company as you enjoy watching the activities on the water in the bay below. ​There is also a small kitchenette with microwave, fridge and tea and coffee making facilities if you want to just chill out. PLEASE READ THIS POLICY CAREFULLY AS IT AFFECTS ALL BOOKINGS.